The Benaud Trio return with The Aussie Album, a beautiful and arresting collection of works that captures modern-day Australia through music. Using Percy Grainger’s ‘Colonial Song’ as its starting point, The Aussie Album touches on questions about what it means to be here and now: our ‘it’s complicated’ relationship with Europe, finding community in our modern lives, the development of a uniquely Australian artistic sensibility and, of course, cricket. They are joined in this stunning recording by star soprano Greta Bradman, whose recent stage performances and recordings have cemented her status as a singer of immense warmth and artistry. To order your copy, please click here to visit the Benaud Trio recordings page. What do you get when you combine Australia’s finest classical musicians with the pop hits from the 70s to the 90s? The best kind of Mixtape! Beginning in 2007, a long-term collaboration between the Benaud Trio and composer / arranger Nicholas Buc has resulted in a string of hits covering some of the 20th century’s greatest popular music. This album demands to be heard – as a trip down memory lane, but also as a realisation of the inherent musical brilliance of these songs, brought to life by some of Australia’s best-regarded classical musicians. Amir Farid performs the complete piano pieces of Stuart Greenbaum composed between 1989 and 2014. This 2 CD release features over two hours of Greenbaum’s output for solo piano spanning a quarter of a century (1989–2014). This comprehensive achievement presents the works chronologically, recorded by a single artist on the same piano in the same room – a unique undertaking. Farid’s reading of the music is masterful, the performances beautiful, profound. Greenbaum says: “the pure feel and sound of the piano is like a second language to me. Some of the music is occasional (written for births, deaths, weddings and birthdays); some works were written in response to works of art or established repertoire (communing with the canon of Western Art Music); others were deliberately blank canvasses inviting more abstract development of musical language. Throughout this, the influence of minimalism, contemporary jazz, blues and rock can be found interwoven with the chromatic, tonal language of the classical repertoire. The piano is not only a beautiful instrument; for me it has been an important tool for musical thinking and for the development of my compositional language. ​To order your copy, please click here for more information, including where to purchase online. Alternatively you can contact me and I'd be delighted to help you out. Enter the world of Russia. Zoe Knighton and Amir Farid present a mix of unknown works alongside much loved classics. The recording celebrates a romanticism in composition inspired by the combination of cello and piano. A duo that relishes playing unknown works alongside much loved classics, Zoe Knighton and Amir Farid enter the world of Russia with the launch of their their fifth CD on the MOVE label - Russian Cello. Inspired by the combination of cello and piano, they perform works by Rachmaninov, Gretchaninoff, Prokofiev, Stravinksy and Glière in a CD celebrating a romanticism in composition. "This CD is chockablock with luscious melody after luscious melody. These Russian composers really knew how to tear at heart strings and to make an audience sit up and listen" writes cellist Zoe Knighton "It has been a really rewarding CD to record - we are particularly proud of unearthing the Gretchaninov sonata which is a real gem." Reviewing the concert to launch the CD on 20 April 2015, Joel Carnegie (The Age) said: "Endearing and earnest, the duo commenced the concert with the crowd pleasing Vocalise from Rachmaninoff – a performance that offered exquisite and at times surprising moments from the pair. Grechaninov's Sonata for cello and piano in E, Op.133 followed – with the contrasting and extended work allowing for jaunty dance-like sequences, floating cello lines, and vigorous melodic back and forths between cello and piano – requiring complete focus from Knighton and Farid. "Glazunov's Elegy in G minor, Op. 44 continued the exploration of mood, with cellist and pianist presenting a collection of emotional states, in this sombre lament for a deceased person. Knighton's reflective and 'heart softening' cello lines in particular were particularly noteworthy. "Stravinsky's Russian Maiden's Song from his comic one-act opera Mavra set Knighton and Farid the task of depicting a woman embroidering in her living room. Gliere's Album Leaf No. 5 offered the pair space to indulge the audience with some quiet contemplation, and Prokofiev's Sonata in C, Op. 119 rounded out an well-rounded evening of hallmark expat Russian fare." Javād Maroufi was one of the first composers of piano music in Persia and celebrated for his contribution to Persian classical music. He was born in Tehran to musician parents Musa Maroufi and Ezra Maroufi – both pupils of renowned master, Darvish Khan. Javad’s mother died when he was young, so he was raised by his father and taught violin and tar from a young age. Amir Farid says this about the music of Maroufi: "Ever since the release of Veiled Virtuosity, my first solo album on the Move Records label, it has been apparent that the inclusion of two of Javad Maroufi’s works for piano on that album proved to be popular amongst listeners. "It was when my good friend Richard Mitchell approached me with the idea to devote an entire album to Maroufi’s output that this project came to life. Working on this project has made me realise how engrained Maroufi’s work has been in my own life, and within Persian (Iranian) culture in general. "Several of his works were amongst the first I ever performed in public as a child, and his recordings would constantly be playing in the household. Being exposed to the sounds of Maroufi throughout my life has made this project both a joy and an immense challenge. After years of intense training as a Classical pianist, it has been difficult to realise the authentic folk-like roots of Maroufi’s work without the interference of other influences. Although the Western influences on Maroufi’s music are apparent and obvious, especially the works of Chopin, it is the fusion with traditional Persian music that truly makes this pioneering composer’s work unique. "I must add that although a lot of his music is indeed notated and published, they only serve as a very rough guide to the final product heard in Maroufi’s playing, and arguably in any successful performance of his work. The improvisatory and freestyle aspect is an essential part of his music, and the challenge here lies in going beyond what’s on the page, while never drifting too far to make the work unidentifiable. Right-hand tremolos, heard frequently throughout this album, imitate the Santur, a Persian dulcimer. This technique (not without its RSI-related challenges!) is engrained in Maroufi’s playing style, as is his gifted ability to freely improvise in a style similar to that heard in a traditional Persian ensemble. My aim has been to replicate this style as authentically as possible, but not without my own insights and influences. I hope this album brings as much pleasure to you as a listener as it did to me during its creation." A charming collection of music from the rich French school of the late 19th century. The sonority of the cello and the beautiful clarity of the piano make this CD both easy to listen to, and moving. The two performers, Zoe Knighton (Cello) and Amir Farid (Piano) are masters of their art. This CD began with Zoe Knighton and Amir Farid reading through a whole lot of music that had been sitting on Zoe’s shelf, unplayed for decades. They quickly fell in love with these French pieces and the CD basically compiled itself. They even recorded too much music and had to cut a short piece by Mompou – luckily he turned out to be from Barcelona. Zoe Knighton and Amir Farid debuted at Melbourne Recital Centre in 2009 and have since released three CDs on the Move label (Mendelssohn cello, Argentine cello and Beethoven cello), performed in the ABC Sunday Live series, the Saturday Sessions (ABC), the Port Fairy Spring Music Festival and throughout regional Victoria. The Benaud Trio perform cherished masterpieces by great Bohemians, Smetana and Dvořák, capped off with a spirited homage to Freddie Mercury's "Bohemian Rhapsody" in an arrangement by Nicholas Buc. The Benaud Trio's Bohemian Rhapsody stands in marked contrast with their debut recording of contemporary Australian piano trios and demonstrates the breadth of their taste in repertoire. In Bohemian Rhapsody the Benauds show their long abiding love for the trios of Smetana and Dvořák. Central in the ethos of the Benaud Trio is their commitment to sharing with audiences both their reverence for the great masterpieces of the chamber-music canon and their excitement in performing the music of the present day. Cellists often bemoan the lack of a cello concerto by Beethoven – and rightly so, but these eight works for cello and piano are the envy of many other instruments. The complete cello sonatas and variations of Beethoven are here on this two CD set. Beethoven had contact with a number of virtuoso cellists (Jean-Pierre and Jean-Louis Duport and Romberg to name a few). Beethoven even went so far as to offer to write a concerto for Romberg, but Romberg politely declined, saying he preferred to play his own compositions. In any case, we are grateful for these five sonatas and three sets of variations. In the late 18th century the cello was beginning to become known as a solo instrument with great expressive potential. As a duo Zoe Knighton and Amir Farid debuted at Melbourne Recital Centre in 2009 and have since released two CDs on the Move label, performed in the ABC Sunday Live series, the Saturday Sessions (ABC), the Port Fairy Spring Music Festival and throughout regional Victoria. As well- known chamber musicians in Australia’s premiere ensembles, Knighton and Farid bring a wealth of experience and onstage rapport to their partnership and performances, and are enjoying increasing demand for their intimate and sensitive live performances. 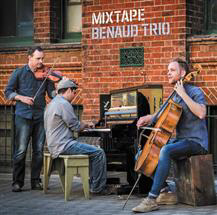 Debut album by the Benaud Trio, featuring works by Australian composers Ross Edwards, Paul Stanhope, Matthew Hindson. More than just Piazzolla, hear the tango as presented by 7 fantastic composers and performed by two of Australia's finest young musicians, Zoe Knighton (cello) and Amir Farid (piano). This CD has been the result of a joint love of Argentine music, a love of the tango and a love of playing together. We have so enjoyed this repertoire and each time we visit these pieces, we feel more attached to them. There are some threads running through our choice of repertoire – the first being an ongoing connection between Europe (specifically Italy) and Argentina. Vincenzo Piazzolla (Astor’s father) is quoted by his son as saying that all the best tango composers come from South Italy. We also follow a geographical thread with the region in Argentina known as the Pampas. Quite often, specific places give rise to a wealth of inspiration and it seems this region has done just that. Mendelssohn is often regarded as a composer who lived a charmed life and therefore whose compositions lack a certain integrity or depth of expression. The gloriousness of his music, its likeability and his creativity in celebrating humanity are certainly primary reasons for his music's longevity. Felix Mendelssohn came from a wealthy family and one that supported Felix's and indeed, his sister Fanny's creative endeavours. These two are perhaps the most famous sibling team in Western classical music. Should one have to endure hardship in order to discover one's inventive and expressive potential? It is easy to forget that Felix died at the extremely tender age of 38 and having just outlived Mozart and Schubert, he certainly deserves his place in the musical hall of fame. (Indeed, his wedding march from 'A Midsummer's Night's Dream' will forever place him in that hall of fame as many a bride has walked down the aisle to those fateful bars.) As with all premature deaths, the question remains - "What if?" His cello works are largely inspired by his brother, Paul, who was an amateur cellist. Imagine the family get togethers with such siblings! One can only be jealous of the flies on those walls. Featuring cellist Zoe Knighton with pianist Amir Farid.